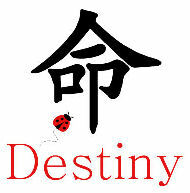 I love the symbol for Destiny - it looks like a little house and the circles are the family in it!!! Cute!!! It's me again! I've just been checkin out all your links! Your nursery its just gorgeous - I LOVE Pooh (Classic or otherwise!). Then I moved onto your timeline. I so feel for you guys, and what you went through last Nov. I pray that your little girl, will come quickly and will remain in your arms forever! Love your blog! As another comment said, it is very cheery and fun to read! I love how you organized the blog links as well.